Armstrong offers a comprehensive range of based mounted pumps designed for a wide variety of applications. 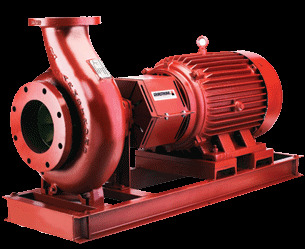 These base mounted pumps are single stage, end suction, radially-split centrifugal pumps units featuring a self-venting casing to prevent air binding. Armstrong base mounted pumps also include heavy duty bearings that are sealed and lubricated for life, a "back pull-out" bearing frame for easy removal, and a self-lubricating mechanical seal to prevent liquid seepage. Base mounted pumps are available in bronze fitted, all bronze and all iron construction. ANSI style centerline discharge casing ANSI flanged casing Pre-lubricated and sealed ball bearings Confined casing gasket Mechanical seal with O-ring mounted silicone carbide seat Stainless steel shaft sleeve Dynamically balanced impellers OSHA coupling guard Baseplate designed to ANSI/HI 1.3.5 rigidity standards for freestanding base. OVERNIGHT SHIPPING AVAILABLE ! - PUMP EXPRESS delivers ARMSTRONG PUMPS and ARMSTRONG PUMP PARTS 24 hrs a day, 7 days a week, 365 days a year DIRECT FROM THE ARMSTRONG PUMP MANUFACTURER TO YOUR DOOR. I need to install two Armstrong 4030 pumps, but I'm tight for space. Any suggestions ? while the second pump is still operating. I would like to know if the Armstrong 4030 comes pre-assembled from the factory ? No ! Pump Express will assemble it and send it out as a packaged unit.